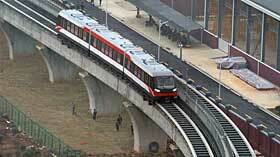 China's first urban maglev was developed by China Railway Rolling Stock Corporation (CRRC). Designed for a maximum speed of 120 kph, normal speeds are limited to 100 kmh. The 18.6 kilometer line connects Changsha South main line station with Huanghua International Airport. There is one intermediate station at Langlizhen currently and two additional stations will to be added in the future. Each CRRC-built trainset of three cars is designed to accommodate up to 363 passengers.